This card costs 0 influence if you have 6 or more non-alliance haas bioroid cards in your deck. Trash a rezzed asset or upgrade. If you do, gain credits equal to its trash cost. Do the credits gained from Product Recall include modifications to the trash cost, such as that from Industrial Genomics? Yes. Modifiers are always taken into account whenever a value is queried from the game state. 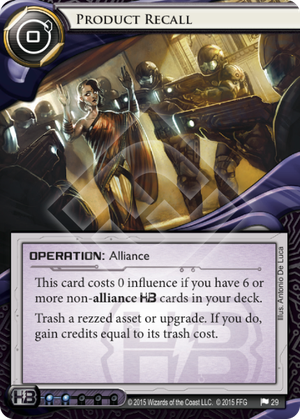 If the Runner accesses an Alliance card from HQ, is the Corp required to tell the Runner how much influence that card is worth in their deck? What about if the Runner accesses an Alliance card from R&D? No. It is assumed that the Corp's deck is legal, and the influence value on the card is irrelevant for the purposes of gameplay. What happens if the Corp no longer has enough cards in their deck to satisfy the Alliance requirement for a card due to cards being removed from the game? Nothing happens. Just like with Cerebral Static against The Professor, the deck building aspect of a card only matters during deck building and not during the game. I have to comment on how freaking awesome the flavor on this card is. You are "recalling" thinking, feeling bioroids, with hopes and dreams, because they didn't live up to your expectations. Brutal. Most chilling flavor since Clone Retirement. Anyway, the card itself. There are two ways to use this: you can either include it with cards specifically to trash them, or you can trash cards you were planning on getting rid of anyway. The first plan is almost always a terrible idea. Even if you're trashing the in-faction Cybernetics Court, that still means you're spending two clicks and two cards for a net gain of 5. That's simply not good enough. The only card that could maybe justify it would be Sealed Vault; installing and recalling a Vault is effectively the same as playing two Hedge Funds but can be done from zero money. What about if you happen to be playing high-trash cost cards already, which you want to get rid of? Eve Campaign is one of the obvious answers, but because you have to trash it while there are 2 still on it you're really only gaining 3. If you're playing Cerebral Imaging, Cybernetics Court is a good fallback for if you run low on money, then you can Recall it to get the same effect plus one. But really where this is useful is in dealing with Executives: The Board, for example, or Director Haas. If they start to look unsafe you can always Recall them, putting them safely in Archives while you pick up a hefty sum from their high trash cost. In either case, you can get more bang for your cardboard buck when you include things that increase trash costs. The three ways to increase trash costs at the moment are Encryption Protocol, Oaktown Grid, and Industrial Genomics. Again, though, you don't want to be putting in cards to increase trash costs just in case you draw your Product Recalls at the right time, but if you're already running IG and can spare the influence for some Sealed Vaults and Product Recalls (or six other HB cards), you could make some serious cash. Industrial Genomics: Growing Solutions + Mumbad City Hall + Mumba Temple + Museum of History + Product Recall. Every turn, shuffle Product Recall back into the deck, install anything worth trashing - either an alliance asset or not - use the temples to rez it, and then use City Hall to trash it with Product Recall. At worst that's, say, 5 for 2 (Mumbad Virtual Tour). At best, you're gaining an insane number of credits from all those cards in archives and trashing an alliance asset. Every turn you want to, because Product Recall is an alliance card, and Museum is too.